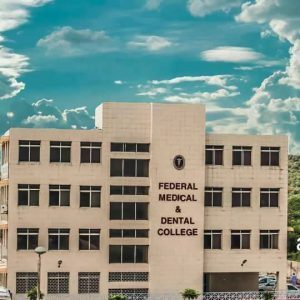 Federal Medical and Dental collage also known as FMDC was founded in 2012. It is a public institute and entertains 100 Bachelor of Medicine and Bachelor of Surgery students each year. FMDC test is conducted by HEC. Students from all over Pakistan can apply for FMDC test and they have a quota system for every province. FMDC test is considered to be one of the most difficult tests of Pakistan, which you can see from 2nd aggregate merit list. Purpose of sharing FMDC 2nd merit list at this moment is that you can have an idea about closing merit of last year. Students who are planning to apply for FMDC test this year should keep in their mind that it is not an easy task to accomplish, so you have to give your 100% in entry test if you want to secure a seat. This entry was posted in FMDC and tagged Best way to prepare for FMDC Entry Test, Entry Test, ETC registration for FMDC, fmdc, FMDC 2018, FMDC admission, FMDC admission date, FMDC admission dates, FMDC admission dates 2018, FMDC admissions date, FMDC Answer Key, FMDC Biology MCQs, FMDC Biology Question, FMDC Biology Question with answer, FMDC Biology Question with answers, FMDC Biology Question with explanation, FMDC Biology Questions with answer, FMDC Chemistry MCQs, FMDC Chemistry Question, FMDC Chemistry Question with answer, FMDC Chemistry Question with answers, FMDC Chemistry Question with explanation, FMDC date, FMDC dates, FMDC English MCQs, FMDC English Question, FMDC English Question answers, FMDC English Question with answer, FMDC English Questions with explanation, FMDC Entry test Format, FMDC MBBS Merit List, fmdc mcqs, FMDC Online Entry Test Preparation, FMDC Past Paper, FMDC Physics MCQs, FMDC Physics Question, FMDC Physics Questions with explanation, FMDC Physics Questions with solution, fmdc solved papers, FMDC test format, MBBS admission on October 11, 2018 by Pakprep.com Admin. Higher Education Commission (HEC) introduced new testing system for Undergraduate admission in Engineering Universities and Medical Colleges throughout Pakistan. Education Testing Council (ETC) test also known as HEC test is eligible for Medical and Engineering admissions in affiliated Institutes. ETC test is acceptable in many Public and private engineering universities and medical colleges of Pakistan. ETC test is free of cost no registration fee will be charged from students and its validity is for two years. There are more than fifty (50) Medical and engineering universities who are accepting ETC test result for admission. ETC test commonly known as HEC test have many different categories for different undergraduate programs relevant to education background. www.pakprep.com is the best platform for the preparation for Medical and Engineering universities admissions. We provides complete material for the preparation of ETC test for medical and engineering universities. Pakprep have more than 15,000+ fully explained MCQ’s with answers and explanation which help students to get good conceptual knowledge of subject which will help them to get maximum marks in ETC test. To start your preparation for ETC test for Medical and Engineering Click here. List of affiliated Medical Colleges and Engineering universities in which students can get admission through HEC organized ETC test. This entry was posted in ETC and tagged Best way to prepare for FMDC Entry Test, comsats, comsats admission 2016, comsats admission 2017, comsats admissions, ETC, ETC affiliated Engineering Universities, ETC affiliated Institute, ETC affiliated Medical College, ETC affiliated Medical Colleges, ETC affiliated Universities, ETC affiliated Universities 2017, ETC BDS, ETC BDS 2017, ETC BDS admission, ETC Biology MCQ's, ETC Biology MCQ's explanation, ETC Biology MCQ's with answers, ETC Biology MCQ's with solution, ETC Chemistry MCQ's, ETC Chemistry MCQ's with answer, ETC Chemistry MCQ's with answers, ETC Chemistry MCQ's with explanation, ETC Chemistry MCQ's with solution, ETC Maths MCQ's, ETC Maths MCQ's 2017, ETC Maths MCQ's with answer, ETC Maths MCQ's with answers, ETC Maths MCQ's with explanation, ETC Maths MCQ's with solution, ETC MBBS, ETC MBBS 2017, ETC MBBS test 2017, ETC MBBS test pattern, ETC MBBS test pattern 2017, ETC Medical, ETC Medical Test, ETC Medical Test 2017, ETC MOCK test, ETC model paper, ETC model papers, ETC past papers, ETC Physics MCQ's, ETC Physics MCQ's with answer, ETC Physics MCQ's with answers, ETC Physics MCQ's with explanation, ETC Physics MCQ's with solution, ETC question, ETC registration date, ETC registration date 2017, ETC registration date for FMDC 2017, ETC registration dates, ETC registration dates for FMDC 2017, ETC registration for FMDC, ETC registration for FMDC 2017, ETC registration for MBBS, ETC sample MCQ's, ETC sample MCQ's 2017, ETC sample MCQ's Biology, ETC sample MCQ's for Chemistry, ETC sample MCQ's for Maths, ETC sample MCQ's for Physics, ETC sample paper, ETC sample papers, ETC test, ETC test 2017, ETC test for undergraduate, ETC test format, ETC test format 2017, ETC test format for Engineering, ETC test format for Engineering 2017, ETC test format for Medical, ETC test format for Medical 2017, ETC test pattern, ETC test pattern 2017, FAST, FAST Admission, FAST Admission 2017, FAST eligibility, FAST entry test, fast mcqs, FAST NU, FAST NU Admission 2017, FAST NU Mathematics MCQs, FAST NU MCQs, FAST NUCES, FAST NUCES Entry Test, FAST NUCES Physics MCQs, FAST online preparation, FAST past papers, FAST Test Pattern, FAST test preparation, FAST undergraduate, FAST undergraduate admissions 2017, FAST undergraduate programs, FAST University Admissions, fmdc, FMDC 2016, FMDC admission, FMDC admission date, FMDC admission date 2017, FMDC admission dates, FMDC admission dates 2017, FMDC admissions, FMDC admissions date, FMDC admissions dates, FMDC admissions dates 2017, FMDC Biology MCQs, FMDC Biology Question, FMDC Biology Question 2017, FMDC Biology Question with answers, FMDC Biology Question with explanation, FMDC Biology Questions, FMDC Biology Questions 2017, FMDC Biology Questions with answer, FMDC Biology Questions with answers, FMDC Biology Questions with explanation, FMDC Chemistry MCQs, FMDC Chemistry Question, FMDC Chemistry Question 2017, FMDC Chemistry Questions with answers, FMDC Chemistry Questions with explanation, FMDC date, FMDC dates, FMDC English MCQs, FMDC English Question, FMDC English Question 2017, FMDC English Question answers, FMDC English Questions with answer, fmdc entry test, FMDC Entry test Format, FMDC MBBS Merit List, FMDC Online Entry Test Preparation, FMDC Past Paper, FMDC Physics MCQs, FMDC Physics Question, FMDC Physics Question 2017, FMDC Physics Question answers, FMDC Physics Question with answer, FMDC Physics Question with explanation, FMDC Physics Question with solution, FMDC Physics Questions, FMDC Physics Questions with explanation, FMDC registration 2017, FMDC registration date, FMDC registration date 2017, FMDC registration dates, FMDC registration dates 2017, FMDC solved MCQs, FMDC Test, FMDC test 2017, FMDC test date, FMDC test date 2017, FMDC test format, FMDC test format 2017, fmdc test pattern, fmdc test pattern 2017, HEC, HEC 2017, HEC admission, Hec affiliated Engineering Universites, HEC Affiliated Engineering Universities, HEC Affiliated Medical College, HEC Affiliated Medical Colleges, HEC Affiliated Universities, HEC Biology MCQ's, HEC Chemistry MCQ's, HEC Engineering, HEC Engineering 2017, HEC Engineering admission, HEC Engineering admission 2017, HEC English MCQ's, HEC Maths MCQ's, HEC Medical, HEC Medical 2017, HEC Medical admission, HEC Medical admission 2017, HEC Medical admissions, HEC Medical admissions 2017, HEC Physics MCQ's, HEC registration, HEC registration form, HEC Scholarship test, HEC Test, HEC Test for Undergraduate, HEC Test for Undergraduate admission, HEC Test for Undergraduate admission 2017, HEC Test for Undergraduate admissions, HEC Test for Undergraduate admissions 2017, HEC Test for Undergraduates, IST, IST Admission, IST Admission 2017, IST Engineering Admission, IST past papers, IST test pattern, IST undergraduate Admission, IST undergraduate Admission 2017, IST Undergraduate Program, List of ETC affiliated engineering universities, List of ETC affiliated Institutes, List of ETC affiliated Medical College, List of ETC affiliated Medical colleges, List of ETC affiliated Medical Institutes, List of ETC affiliated universities, maju, Maju Admission 2017, maju admissions, maju engineering, MAJU entry test, MAJU Entry Test Format, MAJU Entry Test Pattern, MAJU Entry Test Pattern 2017, Maju free Structure, Maju Islamabad, Maju Karachi, maju mcqs, MAJU merit Calculation, Maju test format, MAJU test format 2017, MAJU test preparation, Maju undergraduate Admission, Maju undergraduate Admission 2017, Maju undergraduate Admissions, Maju undergraduate Admissions 2017, Maju University on August 17, 2017 by Pakprep.com Admin.